Greenland Sea Cold Water Re-Cycling Has Nearly Stopped. Britain Expected to Become Cooler. – Ocean Physicist Peter Wadhams, Cambridge University, U. K.
Labrador and the British Isles are on the same latitude. But Britain has enjoyed a mild climate compared to cold Labrador because of the North Atlantic Drift, also known as the Atlantic Thermohaline Circulation, which conveys warm equatorial water to the U. K. and Faeroe Islands. 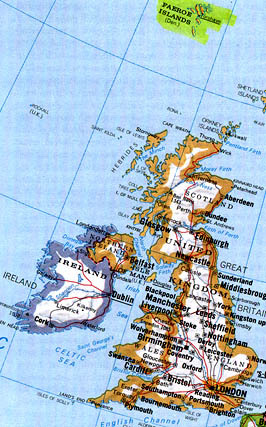 May 11, 2005 Cambridge, England – Normally in the Atlantic Ocean, warm water moves from the Equator up to the British Isles, keeping England and parts of Europe warmer than Labrador which is at the same northern latitude. The warming is caused by a huge convection process called the Atlantic Thermohaline Circulation, or North Atlantic Drift. Equatorial warm water is circulated to the Labrador Sea and Greenland Sea, cools off, and then sea ice forms. The ice does not take up the sea salt which is left behind in the ocean and makes the water denser and it sinks. For more than a century, at least a dozen cylinder-shaped columns of cold water have been sinking into the deep ocean and heading back south toward the Equator which has kept the big conveyor belt of warm-to-cold-to-warm water going in the Atlantic Ocean. But now for the first time, Cambridge University Physicist, Peter Wadhams, has discovered that those dozen cold water columns in the Greenland Sea have nearly disappeared. Prof. Wadhams is also head of the Cambridge Polar Ocean Physics Group. 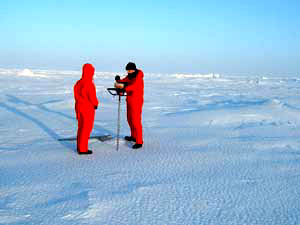 He reported last week in Vienna at the European Geosciences Union meeting about his field research in the Greenland Sea. With a changing, slowing thermohaline circulation, Great Britain and parts of Europe will become colder over this century as the rest of the planet gets warmer. Atlantic Thermohaline Circulation map © Woods Hole Oceanographic Institution. Peter Wadhams, Ph.D., Prof. of Ocean Physics and Head of Polar Ocean Physics Group (POPG), University of Cambridge, England has studied the Greenland Sea cold water circulation since 2001. Image courtesy POPG. Peter Wadhams, Ph.D., Prof. of Ocean Physics and Head of Polar Ocean Physics Group, Dept. of Applied Mathematics and Theoretical Physics, University of Cambridge, Cambridge, England: “The problem has been that in the last few years ­ in fact, since 1997 ­ this area of ice has not formed in the Greenland Sea. Part of the reason is global warming and partly because the wind system has changed. So, that part of the Greenland Sea remains ice free and there is not the driving force for the sinking of the cold water. This means that the volume and depth of this sinking process, or convection, has been reduced. That’s weakening the circulation of water in the Atlantic and there is a reduction in the amount of warm water that once headed north and bathed the shores of Europe, keeping it warmer than it would otherwise be. That’s the main thing that we are finding. This has been found by a number of different research groups looking at ocean properties, but we found it in relation to studying the Greenland Sea sinking site itself. We’ve gone there every winter and summer for the past four years. We found that the sinking happens in the form of current ‘chimneys’ ­ that’s a kind of narrow 10-kilometer-wide (6.2 miles) rotating column of water ­ where the surface water is sinking through that column down into the deep ocean. This seems to be the mechanism by which the circulation happens. We found that these ‘chimneys’ are very long-lived. But there are only two of them in existence at the moment, while seven to eight years ago when they were first studied, there were at least a dozen. I think what’s happening is because the ice is not forming in the central Greenland Sea anymore, chimneys are not forming either. We’ve just seen the last couple of chimneys fading away now. We do expect that this reduction in the volume of sinking water will lead to a reduction in the volume of warm water reaching Europe. That will cool down Europe ­ or at least parts of Europe that are accessible to the ocean. This is something that will take over from global warming for Europe, not for America or Asia. They will continue to warm at the rate of global warming, but the prediction of computer models are that Europe will warm more slowly because of this effect. By the end of this century, Europe will be back roughly at the same temperature that it is today while everywhere else in the world will be warmer. We’re getting the cooling effect in Europe which will be offsetting global warming for us. WHAT DO YOU EXPECT TO BE THE WORST CASE? The worst case might be ­ what would happen is if this local effect kept Europe much cooler than it would otherwise be, it would have quite a lot of other effects as well. It’s like an isolated island of cooling in a big hemisphere of extreme warming. So, there will probably be much more violent weather. There would be changes in the ocean conditions as far as fish and plankton are concerned. We would be seeing quite a lot of changes that would likely make Europe a more climatically violent place than it is now. THEN IF EUROPE COOLS DOWN WHILE THE NORTH AMERICA CONTINENT AND OTHER PARTS OF THE GLOBE ARE HEATING UP, WOULD THAT MEAN VIOLENT WINDS AND INCREASED RAINS AND DEEP SNOWS WOULD BECOME PERSISTENT IN BRITISH AND EUROPEAN WEATHER PATTERNS? Yes. (England and coastal parts of Europe) will be getting more violent conditions and in general, one of the aspects of global warming is increase in extremes of violent types of weather that are due to the higher temperature differences that are happening everywhere. So, every part of the world can be expected to have more variable weather, more extremes of climate than we are getting at the moment. ISN’T THIS GOING TO TAKE A MAJOR FINANCIAL TOLL ON REALLY ALL THE GOVERNMENTS? Yes, it is. That’s the really crazy thing about the idea that, for instance, the U. S. shouldn’t do anything about global warming or reduce oil consumption or carbon emissions because to do so would cost too much for the economy. In the long and medium run, the cost of climate change is going to be infinitely greater than any cost of trying to mitigate it. What Happens If the Thermohaline Circulation Stops? I REMEMBER DOING MY FIRST REPORTS ABOUT THE POTENTIAL THAT THE NORTH ATLANTIC DRIFT COULD STOP ALTOGETHER JUST A FEW YEARS AGO WITH THE COLUMBIA UNIVERSITY ATMOSPHERIC PHYSICISTS. I REMEMBER THEY WERE SAYING THAT THE CONSEQUENCES OF IT SLOWING DOWN CONSIDERABLY OR STOPPING COULD PLUNGE EUROPE INTO A DEEP FREEZE. That was the theme of the film The Day After Tomorrow, but I wouldn’t be that pessimistic about it. There is certainly going to be a noticeable effect and it’s going to stop Europe from warming, but I don’t think it would actually go to the length of plunging Europe into a deep freeze. It would if the North Atlantic Drift or Gulf Steam actually stopped. If we look across the Atlantic to the same latitude as say Britain, we have Labrador which is a pretty much Arctic region. It’s the same latitude as Britain which is pretty temperate. That is the difference between sitting in the warm current or sitting in a cold current. You can point to Labrador and say if the Gulf Stream stopped, Europe would look like Labrador. But I don’t think the Gulf Stream is actually going to stop. It’s simply a matter of slowing because that component of it (Greenland Sea) is not being driven anymore. But the wind-driven part of it is still going strong. BUT WOULD YOU HAVE THOUGHT THAT BY AS SOON AS 2005 THAT THE GREENLAND SEA DOWN CURRENTS WOULD BE ALMOST GONE? 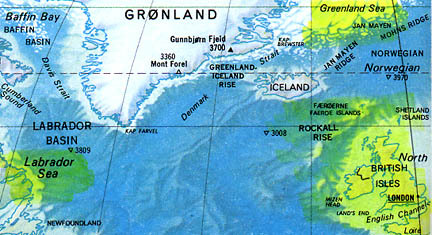 No, that was a big surprise because this region of ice formation in the Greenland Sea which is called the ‘Odden’ ­ a Norwegian word that means ‘tongue.’ It’s always been there every winter since it was first discovered, which was in the early 19th Century when seal-hunters used to go there because that’s where the seals would hold up to have their pups. So it was recognized very early on as an annual feature. That’s where the seal hunting ships went. Then suddenly in 1997, it stopped forming and hasn’t been seen since. So that’s a pretty sudden change that nobody expected. DO YOU REMEMBER WHAT YOUR OWN INTERNAL THOUGHTS WERE WHEN YOU DID THE LAST SERIES OF MEASUREMENTS THAT INDICATED THE CURRENT ‘CHIMNEYS’ OF COLD WATER AROUND GREENLAND WERE DOWN TO ONLY TWO VERY WEAK ONES? Yes, I was thinking that the ocean is changing much faster than anybody had thought! When I first went into oceanography over 30 years ago, as a science it had just reached the point where oceanographers thought if they just sent out ships all over the world, eventually you would build up a picture of the state of the ocean: the currents and temperatures and salinity and plankton. You could gradually build up that and put it all in an Atlas and improve the Atlas every year by exploring the world and gradually improving the map of Africa. Oceanographers did not think that the ocean could change very much. They thought you just had to map it once and there you were. But now we are finding it’s just changing very rapidly and everywhere we look. It’s not a constant part of our planet. We used to think that whatever happens, there is the ocean always the same. But it’s not. It’s changing very fast. That makes one feel a lot less safe, I suppose, on this planet. GIVEN THE FACT THAT WE HAVE LESS THAN TEN YEARS EXPERIENCE WITH THE GREENLAND SEA’S CURRENT CHIMMNEYS APPARENTLY STOPPING, IS IT FAIR TO SAY THAT THE NORTH ATLANTIC DRIFT MIGHT STOP ALTOGETHER IF THE MELT OF GLACIERS AND OTHER NEUTRALIZING IMPACTS ON SALT WATER CONTINUE? Yes, but (stopping) is a different thing. It would take a very long time. There is the possibility in the very long term that the Greenland ice cap will start to melt, or perhaps already is starting to melt. Then that would release a very large amount of fresh water into the ocean at high latitudes that would spread a kind of ‘cap’ over the ocean that would completely prevent any sinking or convection going on because the surface water would have such low density. It would be almost fresh. That would be a very important event. Something like that seems to have happened at the end of the last Ice Age when the big ice sheets in the northern hemisphere were melting. But even with global warming going sort of roaring mad, which it might well do if we don’t stop burning carbon, then the Greenland ice sheet will still take a long time to melt ­ at the orders of hundreds of years. So, I don’t think that effect will come in for a long time. IF IT DID THOUGH, WHAT WOULD BE THE WORST CASE FROM THE COMPUTER MODELING? I think you would have to look at the people who do computer modeling of past climate. People have tried to model how the last Ice Age ended – what’s happened when lots of fresh water suddenly appeared in high latitudes. It seemed to have been that a strange effect occurred. A lot of fresh water was released in one go and this capped off the North Atlantic from the convection process and that then had this cooling effect on Europe and North America as well. The world went back a little way into the Ice Ages conditions again. Then it took another warming impact to get us out of it. That sort of thing might happen. There would be the possibility of cutting off the circulation could push areas like Europe into very cold conditions. SINCE THIS IS SORT OF LIKE DOMINOES FALLING, WE DON’T REALLY KNOW FROM EXPERIENCE EXACTLY WHAT THE CONSEQUENCES WOULD BE APART FROM THE COMPUTER MODELING? Yes, that’s true. I don’t think it (Atlantic Drift) would stop altogether because part of it is wind-driven, so it’s driven by patterns of wind over the ocean. That will continue. It’s more a matter of it slowing down because the part that is driven by this vertical circulation would stop happening. But it’s true, computer models are not the be all and end all. The computer models that have predicted the global warming seem to be very good when you hind cast them for the last 50 years, that is, go back and see what they predicted for what has happened. They agree pretty well. So, I think the model predictions are pretty good for global warming as a whole. But this effect of the slow down of the Thermohaline Circulation was something that didn’t even enter into computer models until very recently. The effects had not even been discovered or thought of. So, it was only when the people who write the models put this effect specifically into the model, that they got the predictions about the cooling. So, they would not have gotten the predictions unless they actually knew the effect was happening. Then they could put it in the model. So, therefore, you expect or fear or suspect that computer models are not that good because there will be other phenomena occurring that we don’t understand and therefore, we haven’t put in the model and therefore, the model does not predict it. It’s a circular argument, but it does mean that the unexpected is very likely to occur. IN THAT UNEXPECTEDNESS, ISN’T PART OF IT THAT SCIENTISTS ARE SURPRISED THAT THE DOWN-WELLING IN GREENLAND HAS ALREADY NEARLY DISAPPEARED? Yes, it has been a very big effect in relation to sorts of changes that normally go on in the ocean. This is a shut down of a major oceanic global phenomenon. It’s certainly that the more people discover about the ocean, the more they are finding that very large changes are going on which were not suspected which affect large volumes of water, involve large temperature changes. In terms of the scale of the planet, they are major changes going on which often are not suspected for a long time simply because it is so much more difficult to study the ocean than to study the land. There are not enough ships to do it and not enough people doing it. So, you can’t survey the ocean as easily as you can the land. These things can be happening without anybody knowing what’s going on. YES, AND THAT IS ONE OF THE MOST IMPORTANT QUESTIONS AS A REPORTER: WITH THE RAPIDITY WITH WHICH GLACIERS ARE MELTING, WITH WHAT YOU HAVE JUST FOUND AS A MAJOR CHANGE IN THE COLD WELLING DOWN CURRENTS AROUND GREENLAND ­ THAT NO MATTER WHAT OUR COMPUTER MODELS HAVE SAID, OR SAY, THE OCEANS ARE CHANGING SO RAPIDLY THAT THE CONSEQUENCES COULD BE DISASTROUS CLIMATE CHANGE? Oh, yes, because so much of the Earth’s climate as weather is dependent on the ocean. It’s three-quarters of the Earth’s surface and if the ocean is changing, it will have quite an unpredictable consequences for different parts of the Earth. EVERYBODY WANTS TO KNOW: ARE WE GOING TO BE SEEING WEATHER THAT IS OVERWHELMING SUCH AS THE FOUR MAJOR HURRICANES THAT HIT FLORIDA WITHIN A MONTH’S PERIOD IN 2004? Yes. Hurricanes, for instance, are more vicious and there are more of them now because the ocean is warming up and the temperature differences that are involved in the evaporation of water from the oceans and the winds in the tropical Atlantic are more vigorous than they were because the tropical Atlantic is warmer. As it gets warmer, we can expect more hurricanes and worse ones. WHAT WOULD HAPPEN IF IT BECAME A REGULAR YEARLY CYCLE OF FOUR OR FIVE HEAVY DUTY HURRICANES HITTING THE EAST COAST OF THE UNITED STATES, FOR EXAMPLE, IN A FOUR OR FIVE WEEK PERIOD? HOW WOULD ANY GOVERNMENT OR NATION RECOVER FROM SOMETHING LIKE THAT? Probably the U. S. can take precautions as far as building codes are concerned, but it will be much worse for the poor countries in Central America where regularly when a hurricane hits, you have thousands of deaths because they can’t afford to build their buildings more strongly. It will be very bad for them and bad for the U. S., but mainly in terms of property damage and not so much in loss of life. BUT IF IT KEEPS INCREASING AND NO ONE CAN GET INSURANCE, THEN IT MEANS EVENTUALLY PEOPLE ARE GOING TO BE FORCED BY CONDITIONS TO NOT EVEN LIVE ON THE COASTS WHICH ARE THE MOST POPULATED AREAS. Oh, yes, in the end, people will need to move inland also because of sea level rise as well. IS THERE ANY SCIENCE GROUP RIGHT NOW THAT IS LOOKING AT YOUR WORK AND NOW LOOKING AT ENGLAND AND EUROPE AND SAYING OR TRYING TO SEE IF THERE IS A TREND IN WEATHER PATTERNS THAT HAS CHANGED BECAUSE OF THE STOPPING OF THE DOWN WATERS IN GREENLAND? There was a discovery in the groups that have been monitoring the northward flow of warm water past the Faeroes ­ those are the islands north of Britain on the way towards Norway. They found that has slowed down and have published some results that show a fairly substantial reduction in the volume of water flow past the Faeroes. That’s a recent result that looks pretty interesting. So, it will become gradually clear that Europe is not experiencing the same warming as the rest of the hemisphere is. WHAT DO YOU WORRY ABOUT THE MOST HAPPENING IN THE NEXT 20 YEARS? Apart from war, I suppose it is the possibility that global warming will go faster than predicted. Already there has been an upgrading in the predictions of the rate of warming. In fact, the last report of the Inter-governmental Panel On Climate Change (IPCC) found the observed rate of warming and computer model rate were faster because there were various processes that had not been included in the models related to the carbon cycle. So, when they reran the models, the rate of warming was something like a third greater. That just happened very recently. Given that computer models can be changed as quickly as that for such a big change suggests there is some possibility that the global warming might start to go much faster than we think, or had expected ­ at such a rate that even if we take fairly drastic action about our carbon emissions, we won’t be in a position to slow it down rapidly enough. This is because of the fact that carbon does remain in the atmosphere for a long time. If we suddenly stopped everything (all carbon emissions), we would still have global warming happening for about another 100 years. THEN WHAT WOULD HAPPEN TO SURFACE LIFE? Prof. Wadhams and his colleagues next plan to study the rate of Arctic ice melting which could also slow down the Atlantic Thermohaline Circulation even more. 08/14/2004 — Oceans Absorbing Greenhouse CO2. As Chemistry Changes, What Happens to Sea Life? 01/09/2000 — Global Warming Alert from NOAA and U.K.